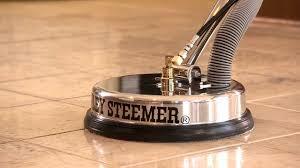 Ceramic tile is one other easiest floors to clean. The glaze keeps dirt out and makes it impervious to staining. The only area where you might have some cleaning challenges have to do with grout. Grout, which is porous, can readily absorb moisture and stains. There are two ways to prevent this problem. First is to seal the grout. Grout sealers are readily available. Second, is to use colored grouts that add a great design element to the room and also keep the grout lines from showing discoloration from dirt and stains. Some companies can even match paint colors. These are widely available but if you're interested, you'll probably have to ask for it.